Ooh, these bloody Panama Papers. It’s like having Edward Snowden as your next-door neighbour for Brave Dave Cameron, as The Guardian goes to work on his family’s offshore tax arrangements. Two things so far reported by The Guardian stand out for me. First, Brave Dave’s old man, Ian, was listed by the Sunday Times Rich List as being worth £10 million. But in 2010, Brave Dave had a publicly declared inheritance from his father’s estate of only £300,000, just under the £325,000 death duties tax threshold. There are four Cameron siblings, so one wonders where the rest of the loot is? Or perhaps what one would like is an explanation as to why there isn’t any more inherited or inheritable loot. Did Ian have a flutter on the horses, perhaps? As The Guardian notes, Brave Dave said in 2012 that he would be willing to publish full details of his tax affairs, and this seems like a jolly good time to do it. Second, Ian Cameron’s company Blairmore (surely ‘moreBlair’?) was window-shopping offshore financial centres and paying zero UK taxes even as Brave Dave became Conservative Party leader and began to rail about the moral iniquity of not paying tax as you should. See here for a Brave Dave versus Jimmy Carr ‘Whose tax arrangements might turn out to be less funny?’ comparison. The key is whether Brave Dave’s immediate family benefited, or will benefit, in any way, at any time, from Ian’s quite legal but morally unpleasant tax avoidance wheezes. Poor old Brave Dave. Why isn’t this happening to someone less agreeable? Like Boris. Or the Thin Controller. Well, just this evening Brave Dave has gone on tv and admitted he’s done a little bit of a porky pie. He sold some shares in moreBlair just before becoming PM for a profit of £19,000. This is the fifth ‘clarification’. Here is The Guardian report. The Guardian‘s Juliette Garside parses Brave Dave’s television interview of last night, here. See her comments down the right hand side. The trail, me suspects, leads to the sleazy island of Jersey… Odds on Brave Dave resigning have shortened from 20/1 to 11/2. Still a reasonable earner. And tax-free, too. I might send a child in a trench-coat over to the bookies’ to put down a tenner. This is excellent, from today’s Guardian. Will it be another bad week for Brave Dave? Over the weekend, Downing Street published a short and sanitised introduction to Dave’s tax affairs. Not even worth posting, since it is just spin. The pressure continues to mount for Dave to take his pants off, and reveal the full story. And the Thin Controller is feeling the heat too. The Treasury said last week he would not publish his fiscal break-down. Now Treasury is hinting he might offer up something. And there are loud demands to know who across the entire cabinet has offshore interests. £3 interest on money in the bank. A timely reminder of how the poor, who have nothing but a little cash in the bank, have been royally screwed by record-low interest rates while the rentier class makes out like bandits from asset appreciation fuelled by cheap debt. £33k is the Thin Controller’s half-share (wife has the other half) of one year’s rent on his London property. £44k is dividends from Sloane-apocalypse wallpaper business Osborne and Little. Effective rate of taxation on the whole lot, earned an unearned (including 120k salary) is 36 percent. And Boris has published his tax summary. Unlike the Thin Controller, he has given us multiple years (what’s going on there, George?). In 2014-15 Boris pulled down £266,000 for his pisspoor Daily Telegraph column. He claims to knock out his columns ‘very fast’ on a Sunday morning, and they certainly read that way. The latest lauds Assad for having saved Palmyra from Isil. In 2014-15 Boris earned £224,000 in book royalties, reminding us that the British public prefers to read this, when it could be reading this. I won’t pass any comment. These two were taken in Norcia, in the south of Umbria. I cannot upload the Harvard page directly into WordPress because the typeface is not supported. So click here to read an English translation of what Yang wrote, or to find a link to the Chinese original. If you are a journalist you might want to print the document and stick it on the bathroom wall. Isn’t it great when art is important, as well as nice to look at? If you get the chance to see Ai Weiwei’s show at the Royal Academy in London, go. It starts with dead trees in the courtyard outside. They have been sawn up and then put back together with iron bolts. This breaking and rebuilding is a favourite trope of Chinese artists who grew up in the Cultural Revolution. Ai opens with a new variant on it. Inside, everything, to quote Ai’s dictum, is politics and everything is art at the same time. 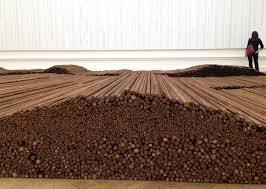 A large room is filled with 90 tonnes of iron rebars from buildings that collapsed in the Sichuan earthquake in 2008. 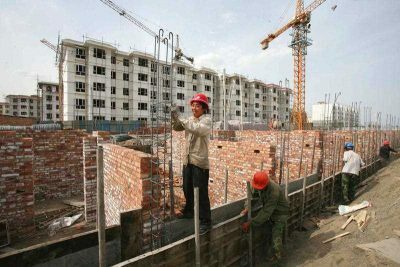 The reason many public buildings fell down is that they were not sufficiently reinforced with steel; the unspoken accusation is that contractors skimmed off money by skimping on steel. On the walls around the sculpturally arranged rebars are the names of several thousand children who died in the earthquake, their names, school classes, schools and towns meticulously recorded, as collated by Ai and his group. In another room is an installation built from the rubble of Ai’s Shanghai studio, bulldozed when the government decided it had had enough of him. Much of the work has actually been done by Chinese craftsmen. Ai provides the ideas — a sort of uncorrupted Damien Hirst running an atelier with a rationale beyond mere self-enrichment. There is a pair of handcuffs sculpted from a single piece of jade. There are CCTV cameras in marble. Ai has even re-wallpapered several rooms of the Royal Academy, including with copies of the tax payments that supporters paid on his behalf when the government hit him with a huge tax ‘bill’ as a means to finger him as a criminal. The work in marble, hard wood, jade and so on connects traditional China with contemporary China in a manner that is subtly subversive. It highlights the beauty of traditional craftsmanship at the same time as making just the type of connection between New China and old imperial China that the government rejects — a connection to do with unaccountable power. There is more than enough stuff that is not aggressively political to give the show balance. Equally, the finale, about Ai’s incarceration, is cleverly handled. It focuses on the psychological torture he underwent. In half a dozen large iron boxes, he is rendered as a waxwork with two guards standing over him has he variously eats, sleeps, undergoes interrogation and defecates. There is no physical violence, but the emotional violence, which can only be viewed through small holes in the iron containers — at one end, and from above, by standing on a step and craning over the top of the box — is palpable. A cheap fan in each ‘room’ produces noise and air movement that makes the experience far more real than any Madame Tussaud’s waxwork. I wasn’t sure how serious Ai was before going to this exhibition. He is very serious and it is a must-see. What do June 4, Falun Gong, and despotism have in common? They’re all terms censored by the Chinese regime. As Internet use proliferates in China, so too does the internet blockade erected to obstruct the free flow of information. June 4, 1989 is the date of the bloody Tiananmen Square Massacre, when authorities killed hundreds if not thousands of student protesters and violently suppressed thousands more. As a result, any combination of 6, 4, and 89 is blocked. The term “Falun Gong” refers to the peaceful self-cultivation and meditation practice that was banned in 1999 following the launch of a nationwide persecution against the practice and its believers. And despotism was placed on the blacklist so that people in Chinese would not be able to criticize the regime with the term. The regime’s censorship mechanism reaches all areas of the Internet: from Western news sources like BBC and Voice of America, to websites and search terms related to Tibetans, Falun Gong practitioners, or other persecuted groups, to any other material deemed sensitive or dangerous to the communist regime. Chinese netizens have therefore turned to more creative measures to communicate on the internet and criticize government policies, since any word or phrase remotely resembling dissident speech unsettles the authorities and finds itself on the list of censored content. Below are some of the ingenious code words, homonyms, and purposeful misnomers, obtained from a comprehensive list by China Digital Times. Explanation: Since the word freedom (自由 zìyóu) is censored, Chinese netizens used “eye-field,” which in Chinese looks like the characters for freedom minus the topmost portion (目田 vs. 自由). It was invented back in 2010, when World of Warcraft players in China realized many words were blocked in the latest version of the game. For some it looks like gibberish, but for those who know the meaning, it is a veiled jab at the Chinese regime. Code words for: Resisting the state by marching through the streets. Code words for: A house visit by the police. Explanation: Since suspicious residents often refuse to open the door to police, instead of violently forcing the door open, which is tiring and time-consuming, police often pretend to be from the water utility company to trick occupants into opening their doors. Code words for: The Domestic Security Department (DSD), a branch within the Ministry of Public Security that deals with dissidents, human rights activists, religious groups, and other so-called subversives in China. Explanation: “National treasure” (国宝-guóbǎo) is a homonym of the DSD (国保-guó bǎo). DSD officials are not subjected to the same oversight as regular police and security officials and enjoy broader powers to violently suppress dissidents or other “dangerous” elements. As the panda is considered China’s “national treasure,” Chinese netizens often use the panda as a symbol of the DSD. Code words for: To die in police custody under suspicious circumstances. Explanation: The phrase was used to refer to cover-ups of police brutality after prison authorities said a farmer in detention for illegal logging had died from a head injury sustained while playing hide-and-seek with other inmates. Explanation: In order to avoid censorship of criticisms of Beijing, Chinese netizens started using the code words “imperial capital” to refer to the city. But the censors have caught up and even the words “imperial capital” were blocked on Weibo, China’s microblogging equivalent of Twitter, as of June 19 this year. Code words for: Circumvent the Internet blockade. Explanation: Chinese netizens term the Internet blockade a wall they try to jump over using a different software, such as VPNs (virtual private networks) that hide their IP addresses. Code words for: Government officials who send illegally obtained public funds to family members overseas. Explanation: The nickname refers to how these officials appear to be “naked,” or without any assets. In China, corrupt officials siphon billions out of China to their bank accounts overseas while ignoring the needs of China’s impoverished. Code words for: China Central Television building in Beijing. Explanation: An outlandish piece of architecture, the building of China Central Television, China’s largest state-run broadcaster and propaganda mouthpiece, is widely ridiculed in the mainland for resembling a pair of underwear or a person squatting over a toilet. Explanation: After Kim Jong Un became the leader of North Korea, Chinese netizens used the term to ridicule the dictator. Explanation: The pejorative nickname gained traction because of the Chinese regime’s tendency to send aid to foreign countries while neglecting domestic problems. For instance, in November 2011, China donated 23 buses to Macedonia, not long after a bus crash in Gansu killed 20 people, including 18 children, according to China Digital Times. The bus had only nine seats, but had been carrying 64 people. Outraged netizens criticized authorities for sending buses meeting safety standards to Macedonia while neglecting to fix China’s own shoddy bus problem. Code words for: Intense public scrutiny. Explanation: The terms are commonly used to invoke a crowd to gather around an event or person online or in the real world and closely observe it. With heavy public scrutiny, authorities won’t be able to cheat the people. Explanation: The Chinese people commonly use the euphemism of someone being invited to drink tea to address being taken in for questioning by the police. Chinese police rely heavily on coercive incentives, like offering “tea,” to make people say something. But when that doesn’t work, they move to threats or violence. Code words for: So-called experts who understate safety risks or justify terrible economic conditions under the orders of state officials or corrupt businessmen. Explanation: The first character (专) in “expert” combined with the character for “rock” (石) creates the character for brick (砖-zhuān), pronounced the same as the first term in “expert.” A play on words, it essentially means these experts are like rocks pandering to the wishes of authorities and lying to the people. Code words for: Creation of a new social media account after a prior one is deleted by the social media company. Explanation: The nickname is used to lampoon Hu for always positively spinning government crimes and wrongdoings. For instance, during the scandal involving Bo Xilai, former party chief of Chongqing who was sentenced to life imprisonment for bribery, embezzlement, and abuse of power, Hu published an editorial titled “Bo’s Case Shows Resilience of Rule of Law.” Netizens angrily criticized him for reporting optimistic falsehoods while omitting how China’s so-called “rule of law” allowed Bo to prosper and continue his corrupt misconduct for decades. Code words for: Trying to prevent people from talking. Explanation: Following the Wenzhou high-speed crash in July 2011 when two trains derailed each other killing at least 40 and injuring nearly 200, Premier Wen Jiabao called for an investigation into the incident to “give the people an explanation.” But on the contrary, authorities aggressively limited reporting on the incident and hastily buried (literally) the crushed train cars in what appeared to be a coverup of evidence. Since “tape” in Chinese is a homophone of “explanation,” indignant netizens used the phrase “give the people some tape” to describe the government’s attempt to hide its failures and prevent people from talking about the tragedy. Code words for: Censored words. Code words for: The current president. Explanation: The derogatory term implies the head of state was anointed the position, rather than popularly elected, and possesses almost absolute power. It was blocked from Weibo search results on August 21 last year. Code words for: The country of the Chinese Communist Party. Explanation: Chinese people often use the terms “my country” to refer to China. The terms “your country” separates the Chinese Communist Party from the state, which are often used synonymously in official rhetoric to equate loyalty to the Communist Party with loyalty to China. As the Chinese people become increasingly conscious of the Chinese Communist Party’s tyrannical tactics, they have started separating the two in their minds and within their Internet posts. So, the Med Men caved. They didn’t have the balls to leave the Euro, which might have been their best option. However I am cautiously optimistic, because a fudge scenario in which Greeks are left in charge of structural reforms and they don’t take place (again) may have been avoided. The Med Men caved to such an extent that it looks like Commission bureaucrats and the IMF will be standing right over them as ‘they’, the Greek politicians, write and implement reform legislation. Like doing your homework with Mummy Merkel leaning down with two hands on the kitchen table. That suggests the reforms and the privatisations could actually get done. The trick is for the EU to ease the pain while the change is happening. A lot of drivel is being written about how the deal is ‘worse than Versailles’ and involves no debt forgiveness. Rubbish. Debt is a combination of principal, the interest you have agreed to pay and the term limit over which you have agreed to pay. There have already been big haircuts on the latter two (in the second, 2012 bailout), and more will come. But Mummy Merkel will have to find ways to finesse a bit of extra current spending to ease the pain of the reforms. This is far from impossible if you believe, as I do, that she is a basically decent person (I’d far rather owe her money than the British government, or indeed the average Greek politician). So let’s see. Assuming of course that those who voted No in the referendum and won don’t — not unreasonably — impose their decision by protest. If the reforms go through and Greece starts to grow that way (rather than as a result of devaluation), it is a warm-up for the Siege of Rome. Doubtless Matteo Renzi, who said he was going to Brussels to tell Frau Merkel how to behave, noted the observation of one person party to the negotiations that Tsipras had been ‘crucified’. Ouch. If, as someone once observed to me, Italians fear pain but not death, that is a horrible prospect. If you have an FT subscription, read Gideon Rachman’s column. He thinks the Greeks won’t do their homework whatever Mummy Merkel does. So less than a week after the Greek people reject a creditor austerity package in a referendum, the Greek prime minister offers a more comprehensive austerity package on their behalf. And most of the media expect the Syriza coalition in parliament to support the austerity package. The cost of the referendum, the massive disruption to the Greek banking system and real economy were for precisely nothing. Still, I doubt that the Greeks, like the Italians, will deliver on the structural reforms that are required (they haven’t so far). They will continue to do the austerity, because budget cuts are easier than fixing institutional problems. But the basic issue of low growth/no growth in unreformed, over-indebted Greece and Italy will remain. Those two countries, and particularly Italy because its economy and debt are so much bigger, are the nub of the Euro-area problem.